AMERICA’S GOT TALENT came roaring back. NBC: AMERICA’S GOT TALENT had a 2.4 season premiere, down 0.3 from 2017, but still a big number for broadcast TV in general, let alone summer. WORLD OF DANCE premiered at 1.8, down a heftier 0.6 from last year. 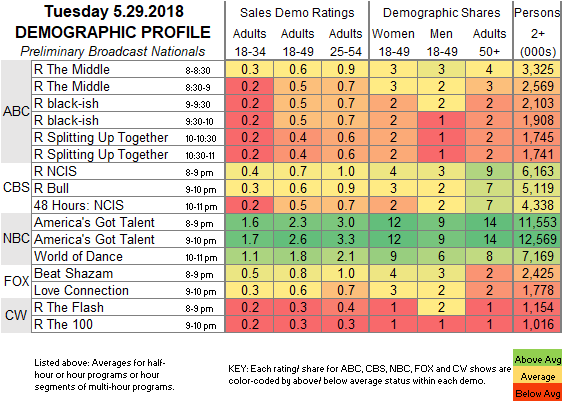 FOX: BEAT SHAZAM returned at 0.8, down 0.4 from the 2017 premiere (on a Thursday), and LOVE CONNECTION came back at 0.6, down half a point from the series premiere (ditto). 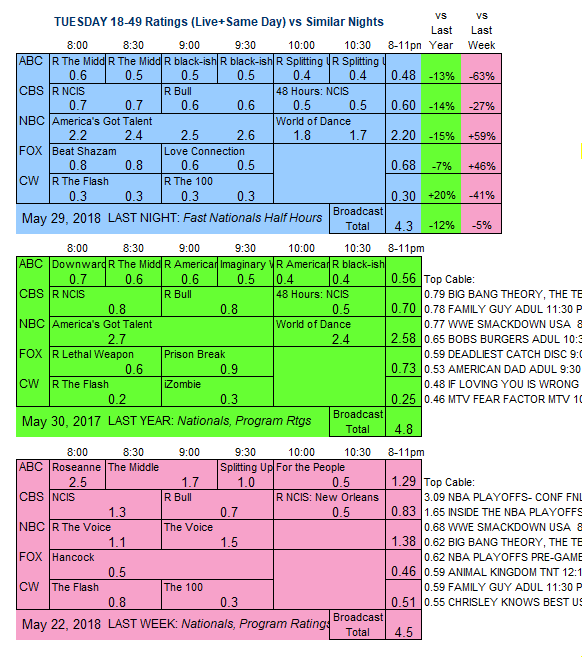 CBS: After 0.7/0.6 reruns, 48 HOURS: NCIS was at 0.5. ABC: A last minute substitution of a rerun of THE MIDDLE for the night’s previously scheduled anchor led to an evening of 0.4-0.6 reruns. CW: Another NY baseball preemption probably means adjustments from the current 0.3/0.3 rerun ratings. NBC introduces its sci-fi series REVERIE tonight, and both AMERICAN NINJA WARRIOR and MASTERCHEF return. But for a small, fiercely dedicated group of viewers, the event of the night will be the series finale of FX’s THE AMERICANS. CABLE RATINGS: Come back Thursday morning for detailed demographic ratings for top Tuesday cable programs, later than usual due to the Memorial Day holiday.